1st or second choice candidates who seek for University of Calabar (UNICAL), Admission 2019/2020 should see requirements, Application Process and be Ready for the Unified Tertiary Matriculation Examination. 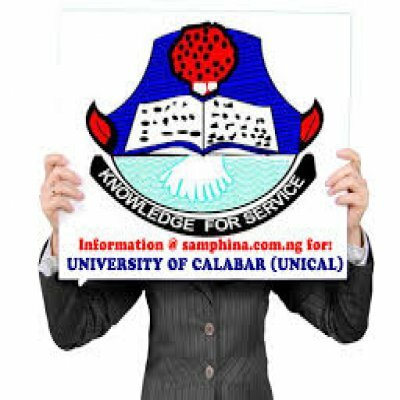 VERY IMPORTANT: The University of Calabar (UNICAL) Post UTME Admission Form for the 2019/2020 is not available at the moment…we will advice that you to stick around or better bookmark this very page once the UNICAL Post UTME Admission Form 2019 is out this page will be updated immediately. While waiting for the University of Calabar (UNICAL) Post UTME Admission Form/DE Screening Exercise for the 2019/2020 see how it was conducted previously. NICAL Post UTME Test will be conducted from Monday, August 13 to Saturday, August 18, 2018 at the University’s CBT Centre. On the home page, enter your correct JAMB Registration NO in the box provided. UNICAL Aptitude Test = N2000. Registration will start from Thursday, July 12, 2018, when the portal will be open. Please note that the portal will however be shut down at 12.00 mid night on Thursday, August 9, 2018. The Post UTME exercise is Computer Based Test (CBT). Special candidate with any form of disability should please indicate during registration. Candidates are advised to check the Portal from Tuesday, August 7, 2018 for their venue and time of the CBT. Candidates are strictly advised to ensure that their correct phone numbers are provided while filling the form online as the University will communicate with them directly. Thank you so much for taking a Tour on this post (University of Calabar (UNICAL), post utme admission form 2019/2020 academic session) we have take time to officially dish out Top Information and Now it’s turn to show us a little gratitude. Help us spread the information by making use of the sharing button Below, and don’t forget to subscribe to get great News and other Information, we wish you success in all your endeavors…Stick around for more Info.